Halloween has got to be one of our most interesting holidays! It is full of mystery, legends and a deep fascination with the unknown. With elements of surprise and unpredictability all add up to one of the most celebrated and decorated holidays by both adults and children alike. If you’re one to host a Halloween party, decorate the front entry for trick or treaters or simply for your own personal enjoyment, I’ve listed some tips and Halloween decorating ideas to get you thinking outside the pumpkin! Balance - the arrangement of elements to achieve equilibrium. Harmony - the arrangement of elements to each other as a whole to achieve unity. Rhythm - the repetition of elements in a regular pattern. Emphasis - enhancing elements by creating hierarchies, focus, importance or element features. Contrast - using variety, subtle or extreme, to create importance and interest in a composition. Proportion - the relationship of scale between elements within a space to one another. Jack o-lanterns – what would Halloween be without one? Put a spin on it…set it upon a pedestal urn, maybe surrounded with some fall branches, fall garland or set upon some autumn leaves. Carving Tip: Apply Vaseline on your cuts, it keeps the pumpkin fresh longer! Another display alternative is stacking 2 or 3 tiered pumpkins in different sizes and shapes. Use your pumpkins after Halloween! They make great planters or as a vase for say a fall arrangement. Dead Branches – They make a simple inexpensive base element to build upon. Cobwebs work wonderfully stretched across them, perched ravens or black crows create a creepy, eerie theme with them. Lining the walk way – Use some Halloween lights or easily create your own with a strand of lights and some plastic pumpkin handled buckets. Tip: Cut a hole in the bottom for the lights to go through and line your pathway with them. Flame resistant luminary bags are also fun, easy, and inexpensive. Tombstones and police tape are fun too. Cobwebs – Cobweb everything! Spider webs are cost effective decorations and they just give people the creeps. Eerie Lighting – Black Lights: Add some into the mix and those spider webs just mentioned will pop and glow along with anything else florescent in color. Tip: Reduce costs and buy standard florescent fixture housings from the hardware store.Flickering flame light bulbs are super fun too and one of those little details that get you that wow effect. They are great in the porch lights, lamp posts, or in chandeliers! Chandeliers –Great for hanging bats from or spiders, a spooky Halloween Witch, eerie Halloween Ghost, ugly dried apple heads. Tip: Choose one item for emphasis and stick with it such as the bats. Jars – Printed labels are always fun but you can take it to the next level and create a spooky science lab setting easily! Fill some jars in various sizes and shapes with colored water, fake eyeballs, teeth or spiders. Decorating Tip: Fill them after Halloween with mini pumpkins and gourds for a fall display. Silhouettes – buy them or make your own, either way they are inexpensive and work great in windows worked into a display or as back drops on mirrors. A theme of Black Cat Silhouette or Witch Silhouettes in the windows is spooktacular! Lastly, always keep your eyes peeled around town, in stores, at haunted houses and around the neighborhood for new ideas and unique Halloween displays. Use those ideas and incorporate them into your own spooky décor. These were just a few ideas to get you started in the right direction, there is an abundance of resources out there for halloween props and displays so have fun! Need inspiration? 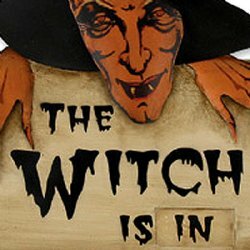 Stop in to the Interior Digs n Gifts shop or visit Interior Digs n Gifts online today and visit us and well get you inspired with some spectacular Halloween Decor, Fall decorating items, holiday design trends, accessories, and more for any décor at a variety of price points to fit your budget!